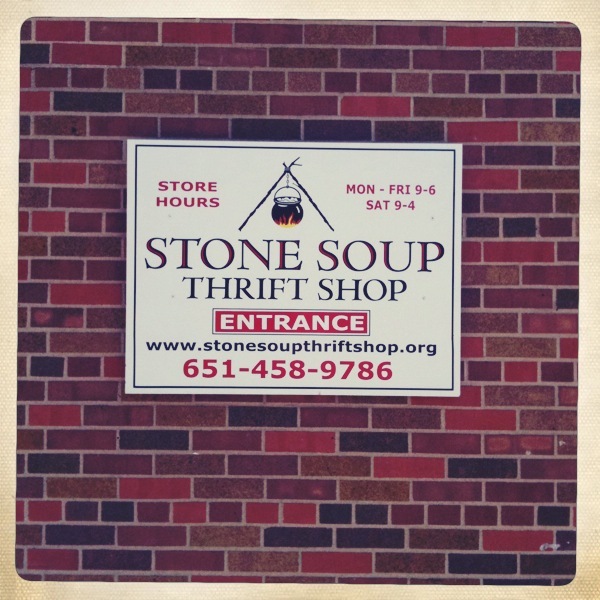 If you’re looking to shop a squeaky clean, well-organized thrift store, Stone Soup isn’t for you. 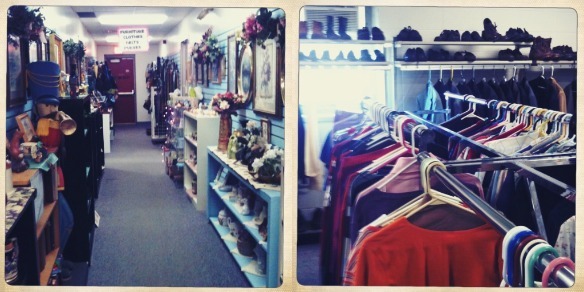 Hidden away in the quaint riverside town of St. Paul Park, this thrift can be summarized with just one word: dingy. However, their prices are low-low-low. So while picking your way through the labyrinth of questionably organized, somewhat stinky rooms may take a bit of time, you might find yourself a gem or two! ♥ Glassware: If I was looking to stock up on ’70s-style glassware—think amber-colored dishes, green textured bowls, yellow votives—for a centerpiece or event, I would for sure come here first. ♥ Free table: In the front room of the shop sits a table full of stuff that’s free. Definitely always worth a once over. ♥ Clothes: Smallish selection of frumpy junk from brands like Sag Harbor, White Stag, etc. If you do happen to find some things that catch your eye, the a la carte price list for clothes is up by the register, but for just $8, you can fill a grocery bag full any day of the week. ♥ Shoes: Again, the selection is small and most pairs are in super shoddy shape. ♥ Furniture: Every single time I’ve visited this store the furniture room stinks like paint, leading me to the conclusion that purchasing furniture from this shop would be a really bad idea. Where does the money raised here go? To the Basic Needs Action Team, a nonprofit that serves the disadvantaged and low-income community. 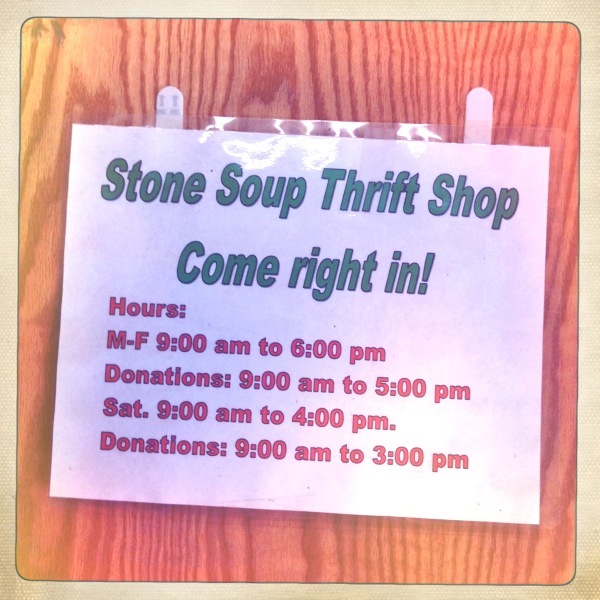 In 2011, $147,294 worth of Stone Soup’s merchandise was given away for free to families in need—a whopping 57 percent of the store’s entire inventory! 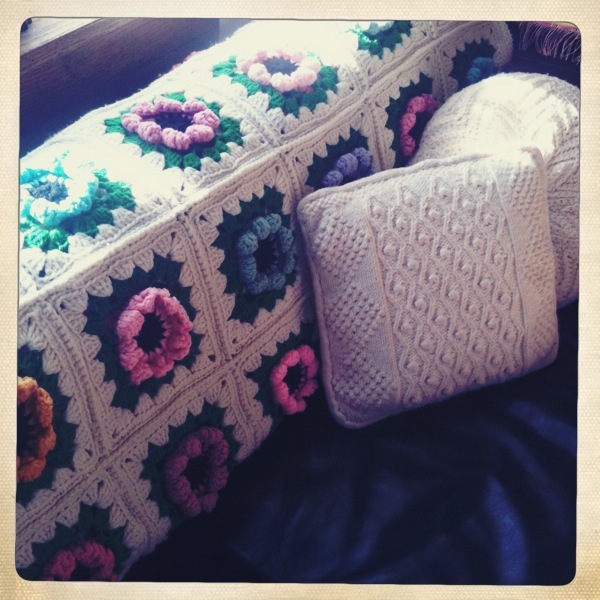 And now here’s where I share a few of my favorite finds from this shop. 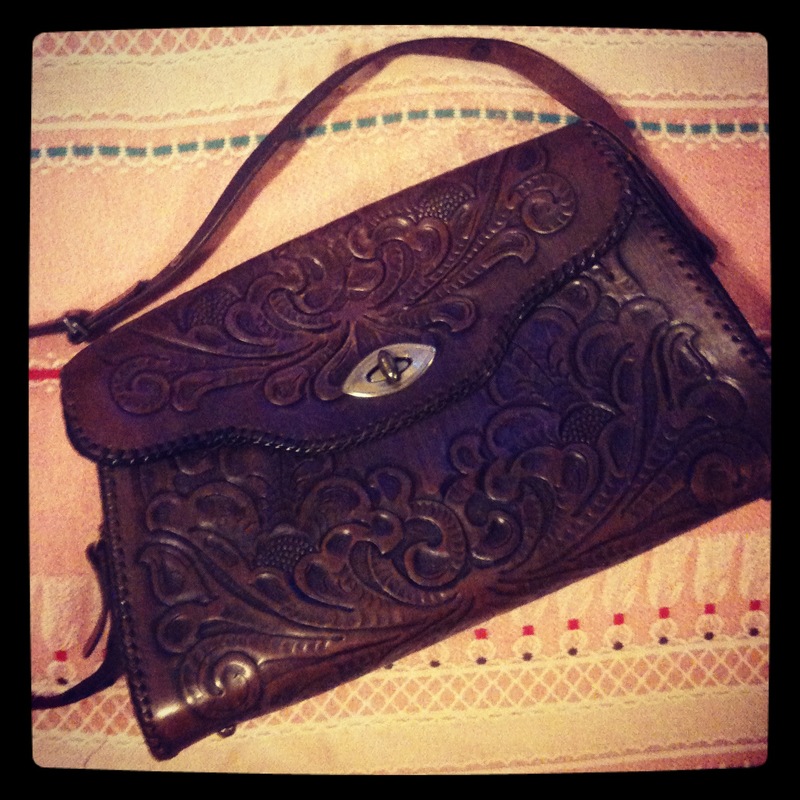 On my last visit, I found two hand-tooled leather handbags for $3-4 a piece. I polished them up with some leather cleaner when I got home and they are looking sharp. As of last year, I’ve instituted a strict buying freeze on afghans, but for some reason, I couldn’t pass this one up. I love how the petals on the flowers fold over—so cute! 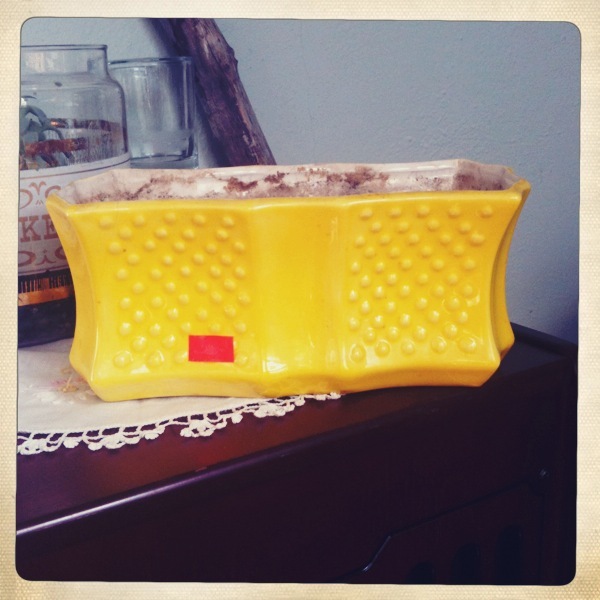 How cheery is this dimpled planter? I’m thinking of popping some succulents into it and giving it to a friend. Hours: Monday through Friday : 9 a.m. to 6 p.m. This entry was posted in Store Reviews and tagged stone soup thrift shop, thrift-store review, thrift-store shopping, thrifting by highplainsthrifter. Bookmark the permalink.